Judah organizes community-wide celebrations at Christmas time, Easter and other times of the year. One of his most effective outreaches is the VBS program that they offer during the Water Festival celebration time in Myanmar. This is a national week-long holiday that celebrates the Buddhist New Year and usually occurs around Easter time. It also celebrates the end of the hot dry season and welcomes the monsoon season. During this time people celebrate by getting drunk, pouring water on others, and generally being loud and often endangering themselves and others. Judah offers a week long VBS program that allows parents and children to come to his orphanage campus for Christian teaching, fellowship, parenting classes, and community meals. Establishing and maintaining good relations with local government officials and Buddhist monks is important and community outreach events help do this. You can also help support community outreach and sustainability by supporting a local cottage industry like clothes manufacturing, making bricks for building or raising livestock to sell. Community outreach also involves disaster relief, gifts of food, building supplies, mosquito nets, and much more. Whether it is a typhoon, tidal wave, famine, or fire, Judah is able to offer Christian love and charity to those in need, in a way that no Westerner or secular agency possibly could. 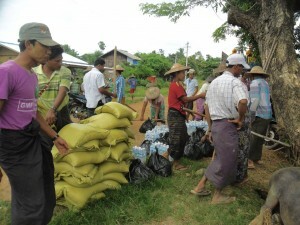 Food, gasoline, building supplies,transportation, mosquito nets, medicine, etc.